UDM Downloads > Amphis - BizMonitor! Amphis BizMonitor monitors key business information from a database and displays information on a summary web page and 24 hour history web page. It can monitor Access databases, SQL Server or other databases. It sends (optional) email alerts when defined thresholds are reached and can send (optional) summary emails of current values. It can also write hourly values to a database (optional) so that the history can be accessed eg to produce reports in a spreadsheet. 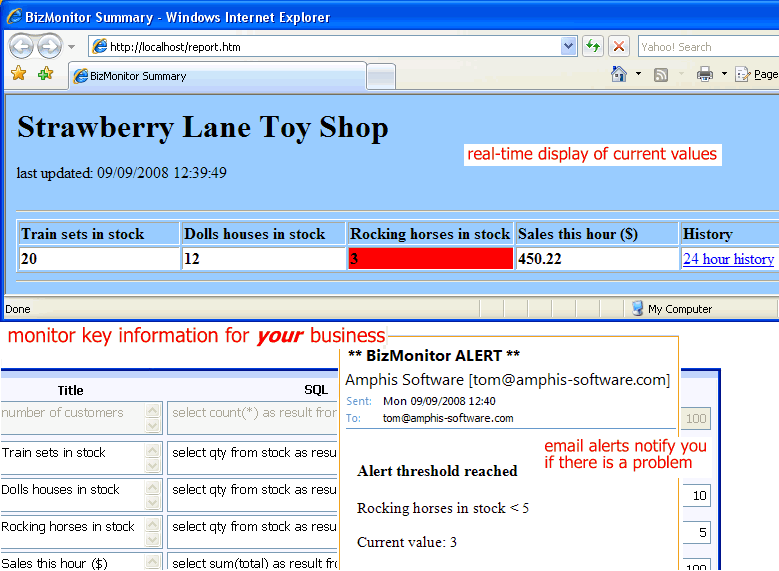 Amphis BizMonitor can be easily configured to monitor the key information for your business.